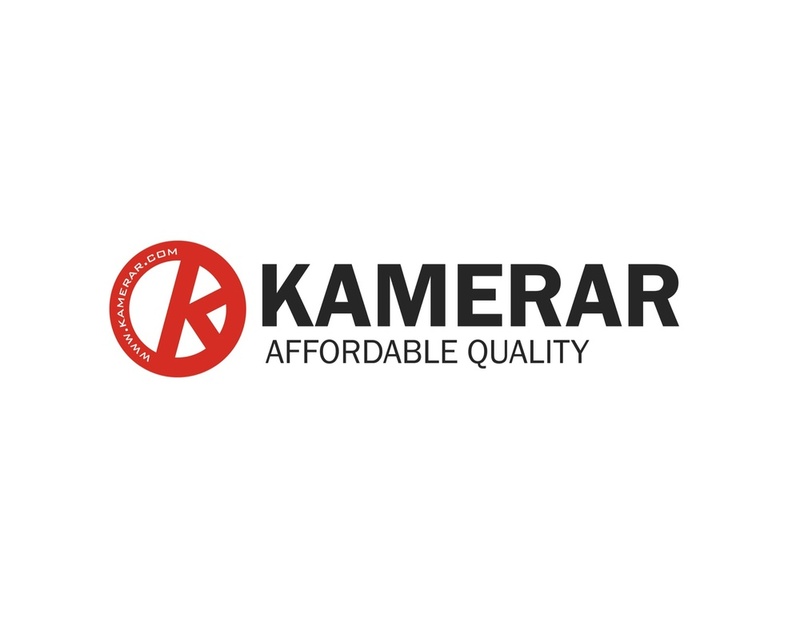 As the Digital Photography market evolves, Kamerar USA continues to be the front runner in providing the very best value accessories for both photography & videography supplies. From straight slides to creative curved movements, the New Kamerar Slider Dolly SD-1 Mark II has been updated with new adjustable roller bearing and a new pulley system. The SD-1 Mark II is a unique linear video camera slider is combined with adjustable axles and smooth bearing dolly wheels. The SD-1 Mark II can also be tripod mounted using either 1/4"-20 or 3/8" threads centered under the slider. It's the most versatile slider on the market. This follow focus is attached with a 15mm quick release rod clamp, which makes it easier to change lenses and gear positions. The FF-3 also has a removable dry erase marking disc that allows you to mark your focus points to allow for precise focus pulling. xtra Universal Lens Gears available for your additional lenses. The Socom Video Shoulder Rig Kit is a solid foundation for video shooters looking to start out in 15mm Rail systems. The Socom Video Rig Kit can be configured as a basic lightweight camera stabilizer. Or configured to a more advanced shoulder rig for supporting LED Lighting, Microphones, LCD Monitors, Portable Audio Recorders, Follow Focus Systems, and more. The rods, clamps, handles, and shoulder pad are based around industry standard 15mm Rod systems which means you can continue to add on optional accessories from P&C, Kamerar or other manufacturers as you advance your build. For mounting accessories, we highly suggest using our Kamerar TOUGH Friction Arms. The long handles are important to prevent arm fatigue during operation, and the unique Shoulder / Chest Hybrid Pad can quickly be adjusted to transform the rig from a shoulder stabilizer to a gun-stock style Video rig. The Kamerar MAX-1 Video Matte Box is constructed from aluminum and molded plastic. It can support a non-rotating single 4x4 Neutral Density Filter through a removable locking tray. The adjustable metal side and top flags shade the camera lens and can be removed easily for easy transporting. The Kamerar MAX-1 matte box mounts to a standard set of 15mm Rails and height on the MAX-1 can be adjusted +/- 2". The Kamerar Universal Donut which is also included which is ideal for stopping light leaks. KAMERAR Sliders SLD-230 Mark II 23" & SLD-470 Mark II 47"
The All New Kamerar Mark II Sliders features all new adjustable roller bearings with a frictionless polymer coating for smooth and quiet operation as well as two balanced wheels at both ends to create a pulley system. 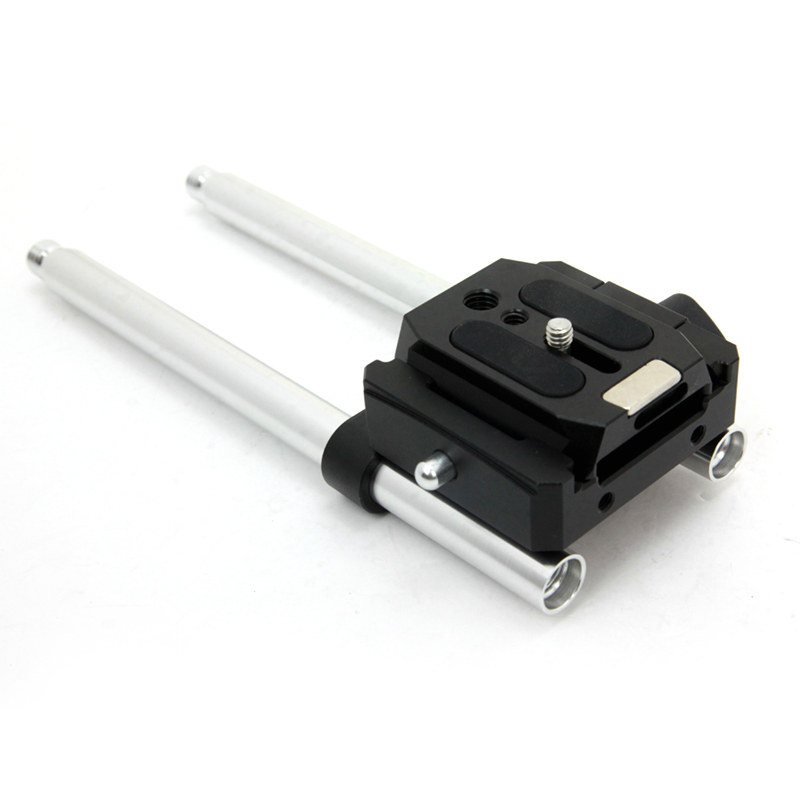 The all metal slider is machined with a black anodized finish to provide lasting durability. The Sliders can also be tripod mounted with both 1/4-20 and 3/8" threads located under the linear rail. The Carrier offers a 1/4-20 male thread for mounting a Ball Head or Video Fluid Head. Kamerar's SLD-230 Mark II Video Camera slider offers almost 2 Feet of tracking in a lightweight unit. Kamerar's SLD-470 Mark II Video Camera slider offers almost 4 Feet of tracking. The QV-1 LCD View Finder will magnify your LCD screen image by 2.5x so that you can easily focus on your subject, and will also offer a true view of your image when working outdoors in bright daylight. Adjustments can be performed to fit a variety of popular DSLR Cameras that use a 3"-3.2" LCD screen. 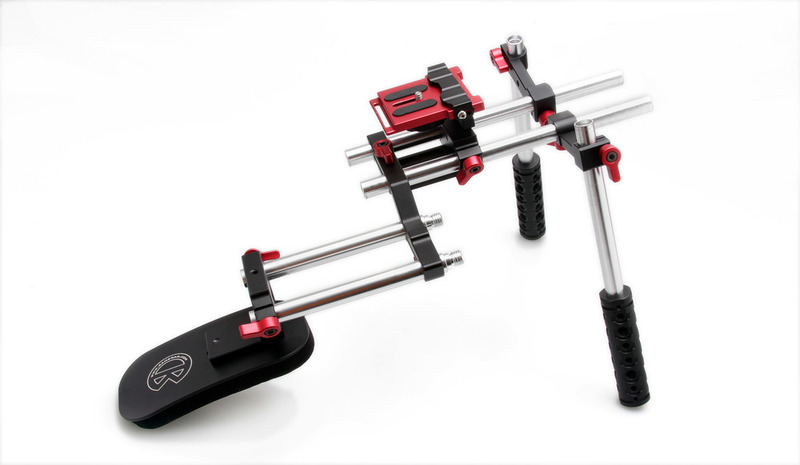 The QV-1 uses an innovative magnetic quick release that inserts to a Manfrotto 501PL compatible baseplate. A design that is both fast and functional. The MagView LCD View Finder is one of our most affordable LCD ViewFinders for Mirrorless Cameras! The MagView View Finder will magnify your LCD screen image by 2.5x so that you can easily focus on your subject, and will also offer a true view of your image when working outdoors in bright daylight. 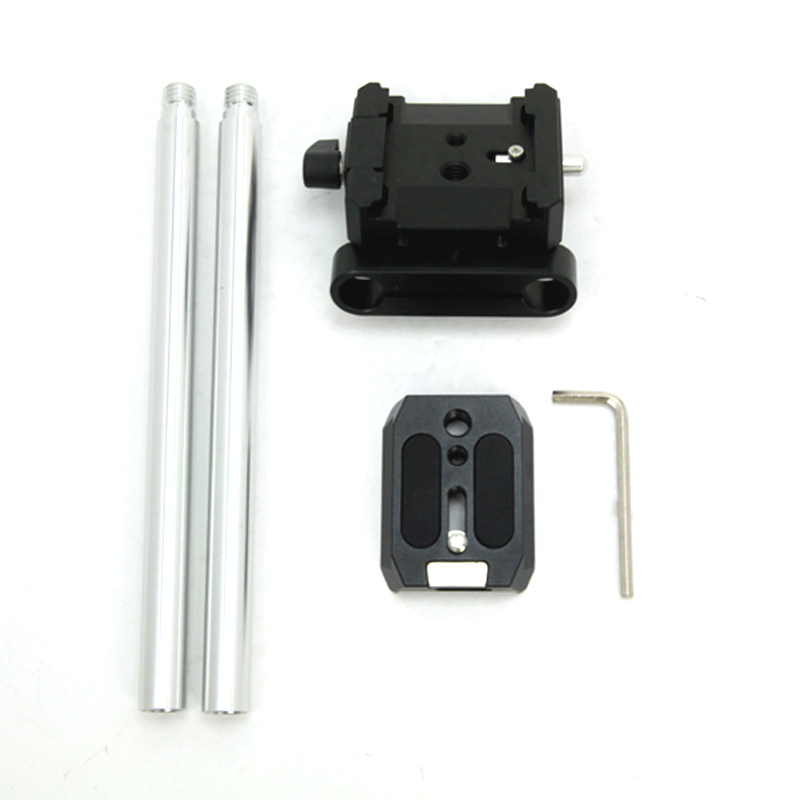 Adds a quick release baseplate and a set of standard 15mm Rails for accessory mounting options. The KAMERAR 'TOUGH' Friction Magic Arm was exclusively designed from the ground up. Every section of the 'Tough' Arms were improved over other existing arms on the market. The stainless steel accents and black anodized finish provide both a professional aesthetic and an extremely long lasting durable finish. The friction arm has two 1/4" male threads that can attach to many standard photo and video accessories including lights, portable audio recorders, wireless audio recievers, LCD monitors, and more. The Kamerar 'Tough' Friction Arms comes with a female coupler to attach to another male thread. The three independent joints allow you to quickly change it's position with a single locking knob. Between the locking knob is a thrust bearing that assists to make locking easier, and stronger. The middle joint uses specially patterned teeth that locks into place preventing slippage from even the heaviest loads. An o-ring prevents contaminants keeping the Kamerar 'Tough' Friction Arms working smoothly. The ball joints are made from durable Stainless steel with a specially micro textured surface to increase grip rate by more than 36% above other similar products on the market. The Quick Snap is designed to let you quickly snap on and off any accessory you need mounted onto your dslr cage or shoulder rig. It has a male 1/4-20 thread, plus a removable 1/4 thread hex nut and a female 1/4-20 female thread on the quick release plate. This allows for the base plate to be screwed into anything that has 1/4-20 thread, than take the quick release plate and screw it onto your accessory for example a friction arm then simply slide the quick release plate onto the Quick Snap's Base plate to make the connection. The Quick Snap makes it effortless and easy to add accessories to your existing video rig, no more screwing things on and off. It is 100% CNC machined, made from aircraft aluminum material. The Pico Plate is a quick release accessory that attaches to industry standard 15mm rails. The Pico Plate offers five 1/4" threaded access holes which can be used to mount accessories, so that you can quickly re-position or remove them from your rig. Included one 1/4" screw, and one 3/8" screw to mount a variety of accessories. Included in the Combo Kit is 2 Pico Plates and a 8" Standard 15mm Rail.